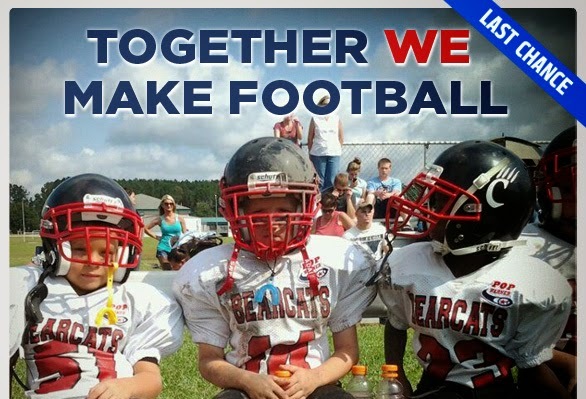 *NO PURCHASE NECESSARY to Enter or Win in the Together We Make Football Contest. Purchasing Will Not Increase Your Chance Of Winning. Many Will Enter, Few Will Win. Eligible minor entrants must have a parent’s or legal guardian’s permission to participate in this Contest prior to participating. Ends at 11:59:59 pm ET on 10/19/14. Open only to legal permanent residents of the 50 U. S. and District of Columbia who are 13+ years as of entry date. Void where prohibited. For complete details, click here for Official Rules.